We’re removing the white space from the email newsletter! Most of you will see the changes when you receive your weekly email newsletter on Monday. Those of you who receive the daily newsletter should have already seen the changes this morning. In an effort to bring more visibility to the content on your website, we’ve reduced the need to scroll so you can get all the information that you need on one page. This entry was posted in eneighbors, product update and tagged email newsletter. Bookmark the permalink. Our e-Neighbors site is 143rd & Quivira, The Villas of St.
Andrews. Can we participate in your Santa & Sleigh Rides? If so, I need info. Thanks. 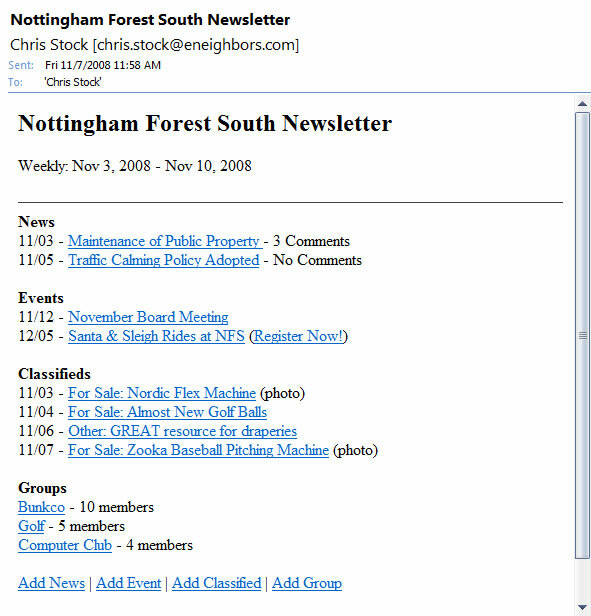 Hi Shelia – I will email you with the contact information for the Nottingham Forest South board. They are responsible for putting together the Sleigh Ride event every year and will be able to answer your question.